1948 Dougie Williams came out of the services and joined the Halle Orchestra. He bought the bass from Victor Watson. It was then a four stringer. Dougie always called it "the Panormo" - Tom Martin and Mike Hart dont think its a Panormo, neither do I. 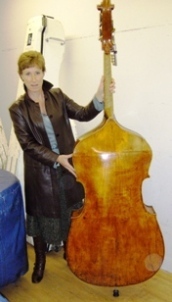 1970s Dougie was No 2 in the Halle and he sat next to Mike Calder, so the Derazey and this bass shared a desk for years. 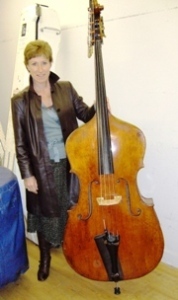 1984 Dougie retired and sold the bass to Diana Milner (pictured above), who was by then my teacher and principal bass with the Halle. So I dont know who made the bass. It could well be a one off made by a decent luthier and as there are fewer basses than fiddles its much harder to make a comparison. Its a fantastic orchestral bass, very long in the body with a big boomy sound. I love it.